Sun's hide and seek games in Cēsis city. What I was re-thinking lately is the kind of a fashion approach that we discussed back in university times. The kind of, let's call it, smart shopping approach quite a lot of European women have been using these past years, when she invests in a quality designer bag, like Celine's Trapeze or latest everyone's crush the Belt Bag version, but then she goes and gets herself a coat from a mass market store, like Zara. 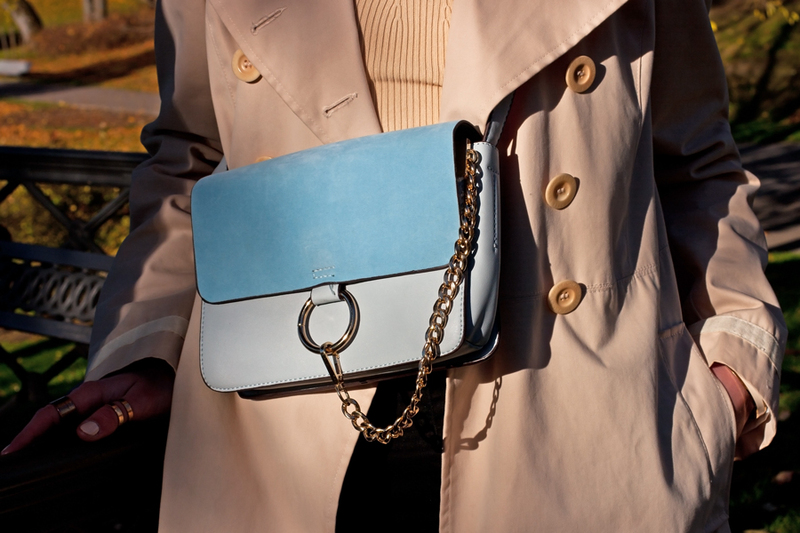 The trick in this shopping (or investment) approach is that bags don't seem to be as seasonal pieces as clothes (read outerwear) are, so it is quite natural that female shoppers would rather invest in quality item that can serve them a year or even more. How come this sort of a shopping trend conquered minds and wallets of modern women? Well, it's all due to financial crisis of 2007-2008 that affected our spending power and shopping patterns (for the better? - assume it to be quite a debatable moment). Speaking of this very outfit combination... well, the See by Chloe trench that really happened to be my long-term investment. I got it like a year ago or so and still can't get over it. A timeless piece I don't mind pulling over and over again throughout Autumn and Spring seasons. And, of course, it fits into my primarily neutral-shaded and practical-much wardrobe direction. Should I also mention this trench came as a Siamese twin (in terms of color of course) for my new Light in the Box top? I do like this kind of win-win situations. Okay. Now such a neutral-y shaded outfit combination, read beige and black, is yet one more perfect example of how I implement just a tiny bit of color into it. Yes, you got it. By means of a colorful bag. I do like the fact such a small piece is able to refresh a whole outfit, and not ruin it at all. I have that bag in grey and it's just the perfect bag! I know, the bag is super cool! And it looks cool in most colors! Ирина, вы совершенно правы. Одеваться стильно и хорошо сегодня можно при любом достатке. Спасибо за такую дельную мысль. Солнечного воскресенья!